I woke up 5:45 and then slept from 7:15 until I woke again at 8:15 and at 10:30 I woke up and got up. I got in my running gear and at 11:00 I ran down the same road. This time I passed a whole group of guys on bicycles and they waved at me. They were dressed like racers and I don't know whether they were part of the Tour de France or not. Later I looked at the race map I had and it showed that the race was going through this area. Maybe they were. I got back to the hotel and was very hot from the run and anticipated trying out their pool. To get there you have to cross the very large yard they have in the back. As I crossed the yard there were swarms of grasshoppers or locusts flying all around me and landing on the grass. I got to the other side and got my shoes and belly pack off and jumped in the pool. I swam for quite a while, avoiding the nest of bees that were flying around and got out and enjoyed a cold coke lite and then took a shower hoping no one would come by. While I was swimming, Marcia went to the town of St-Rémy at noon to try to get her bangs cut. She told me later that the girl at Nature Coiffure did it for free, which was very nice. The French have all been nice to us wherever we go. She had lunch and went shopping. At 12:30 I started the first of my two cappuccinos they made for me. I sat in the courtyard and relaxed and did diarios until 2:00. When Marcia got back she went for a swim in the pool; more swimming then she has done in years. I finally gave up and continued my work back in the room. We decided to stay here an additional day for two reasons. One, there was probably no better chance getting a room ion Arles then there was yesterday and two, why not just take a day off from traveling and relax at this beautiful spot. I spent a total of seven hours working. ....and the shots of the town of Les Baux as we got closer and closer to it. We arrived there at 7:50 and we were able to park free (you can see the parking lot in the photo above.) 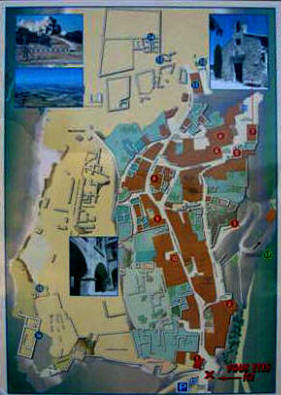 The entry maps show you what there is in the town and how to get there. The bauxite (aluminum ore, discovered here in 1822) was named for this city but there is no longer any mining done here. It is 3,000 ft (900 m) long at an elevation of 920 ft (280 m). 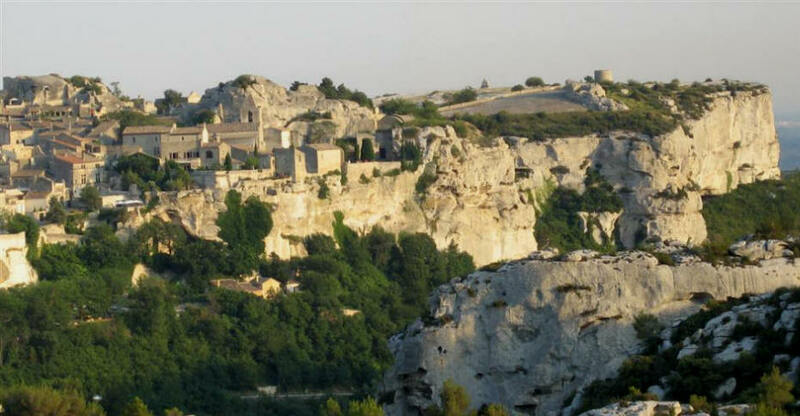 It was originally inhabited in the Iron Age but came into prominence in the Middle Ages when it was the citadel of the powerful seigneurs of Les Baux, (first record, 960: Balcium) who ruled with an iron fist and sent their conquering armies as far away as Albania. They held control of 79 local towns and villages and the flourishing culture of Les Baux attracted troubadours from all over Europe to the "court of love" and their new form of feudal music. 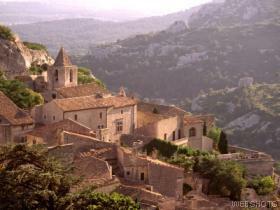 Later, Les Baux was ruled by the notorious "Scourge of Provence," Raymond de Turenne, who sent his men throughout the land to kidnap people. If a victim's friends and family could not pay ransom, the victim was forced to walk a gangplank over the cliff's edge. Its power lasted until Alix, the last princess died. In 1528, it had a short period of prominence under Anne de Montmorency and became a hotbed of Protestantism. We took a stroll into the town which was full of old quaint ancient buildings, many of them housing eateries. There was a lot of walking up. Here are many scenes of this picturesque little town. It was very lovely. We went all the way to the top via the street leading up to the ancient church (left in lower right photo). We started out with Aqua minerale con gas and a bottle of local red vin (Cote Sud). Marcia started out with a vegetable tart which she liked but I didn't care for. For main course, Marcia had trout with almonds and a ratatouille, while I had fettuccini Bolognese. Both were OK but this was not a gourmet meal. We walked back down to the parking lot and drove back down the winding hill getting back to the hotel at 10:30. I was able to get online and do AOL email and download Rush but it didn't go well so I worked on diarios for a while and got to bed at 1:45 AM. A very relaxing "day off."